The technology has evolved dramatically from the conventional use of the desktop computers in the late 1950s to the present day high-tech sophisticated systems. The modern day conveniences and the exponential progress on a global level are evident of the fact how far technology has come and how far it will go. The dreams of the past have become the reality of today. Technology has made everything possible we only dreamt of. Technology is the reason behind the every BIG change on the planet such as multimedia. It is a fusion of digital technologies based on the use of computers. Because of the advances of technology especially in the context of multimedia and internet, we are experiencing a whole new level of entertainment. Then comes the hypertext, the next level of digital media which is beyond the general understanding of the term multimedia. Multimedia simply can be defined as the use of multiple forms of media to present information. 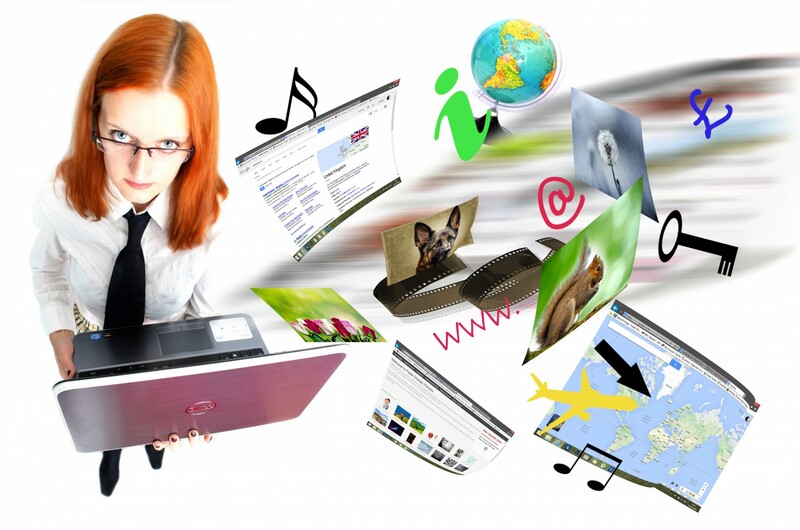 It is an integration of different forms of media such as text, audio, video, images, and still or animated graphics with the computer technology. Initially, the term multimedia was used in the context of media devices such as audio tapes, sometimes supplemented by videos. However, as technology evolved so does digital media. From multiple devices support, it all comes down to a single integrated device and the computer plays a central role in the present day multimedia paradigm. The network of interconnected media forms that are linked together in a non-linear fashion we call the World Wide Web are called hypermedia. It’s a cross-linguistic exchange of nonlinearly distributed data or information based on a shared structure. It is an extension of the term hypertext – text with links to other text – that refers to the presentation of non-linear data which makes it easy for the users to explore the world of internet via clickable links of web browsers. The need for a more sophisticated form of media and non-linear association of digital content have brought the concept of hypermedia from the past to the forefront of the World Wide Web. Multimedia is a much broader form of digital media defined as an integration of different forms of content such as text, pictures, graphics, audio, animations and video where the information is processed digitally. In simple terms, it is the representation of content using multiple forms of media thorough computer software and hardware. Hypermedia, on the other hand, is a more diverse, non-linear form of digital media. It is an extension of the term hypertext in a non-linear way meaning it is multimedia presentation of non-linear forms of media which are linked together by a hypertext program. Multimedia, in general, is the combination of audio and visual representations that allows people to communicate and share ideas with digital and print elements for a more enriched experience. Multimedia technology is a convergence of hardware and software used to create computer-based, interactive applications in both linear and non-linear fashion. Hypermedia contrasts with the term multimedia in a much broader sense where every accessible element on the World Wide Web becomes a link that users can both read and interact with in one or many ways. 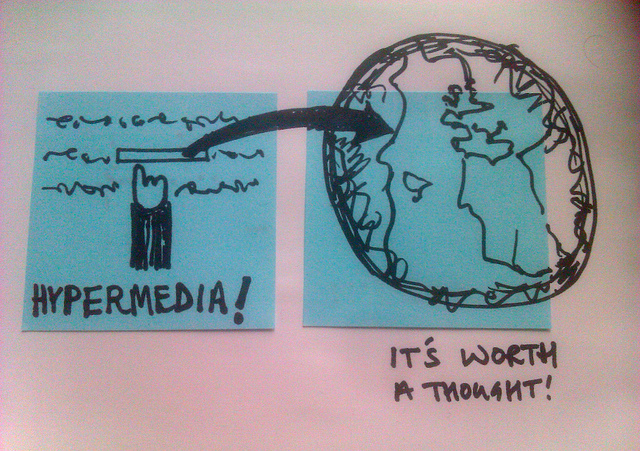 These non-linear forms of media are called hypermedia. The success of a multimedia presentation depends solely on how the data is represented to best serve its purpose. Multimedia applications require computers supporting multi-sensory Input/output devices to represent digital content and multimedia information using text, audio, video, pictures, and graphics. The multimedia information is so represented that can be made easily presentable to the end user. Hypermedia makes multimedia more interactive and diverse by allowing users to access non-linear content using clickable links on a web browser. Hypermedia is simply the ability to put links into your API resources to represent and manipulate navigation between resources. Multimedia model is based on two key concepts: integration and interactivity. Integration mainly refers to the objects of communication external to the computer such as text, audio, video, graphics and animation. Interactivity refers to information delivery based on user input and data representation based on the content of information for display. Hypermedia model is based on a relational database organization which facilitates a network of interconnected multimedia documents or information by creating associations between them via extensive cross-referencing of related items. This allows users to access and utilize the data and information effectively in almost infinite number of ways. This article explains the two media same-alike terms which are often confused with one another, multimedia and hypermedia. Although both the terms are used in the same context when it comes to accessing media, they differ in the way they are used to represent media content and information. While multimedia simply refers to multiple forms of media, hypermedia is used in a much broader sense to refer to media with links to other media. Multimedia is anything you can see and hear, whereas hypermedia is something you can see and interact with at the same time. Hypermedia simply means referencing one media type to another media type via clickable links. Sagar Khillar. 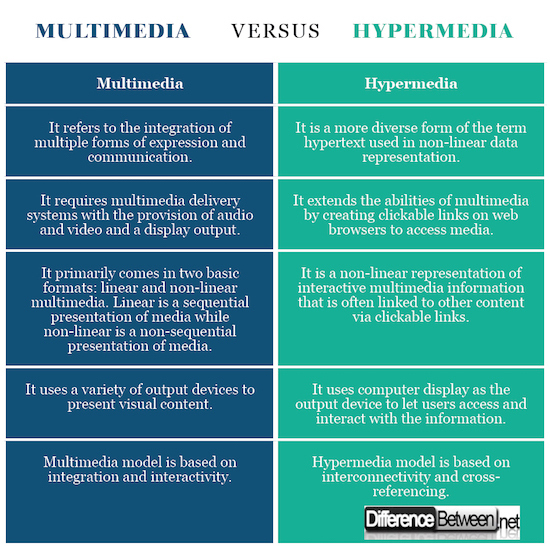 "Difference Between Multimedia and Hypermedia." DifferenceBetween.net. May 15, 2018 < http://www.differencebetween.net/technology/difference-between-multimedia-and-hypermedia/ >.